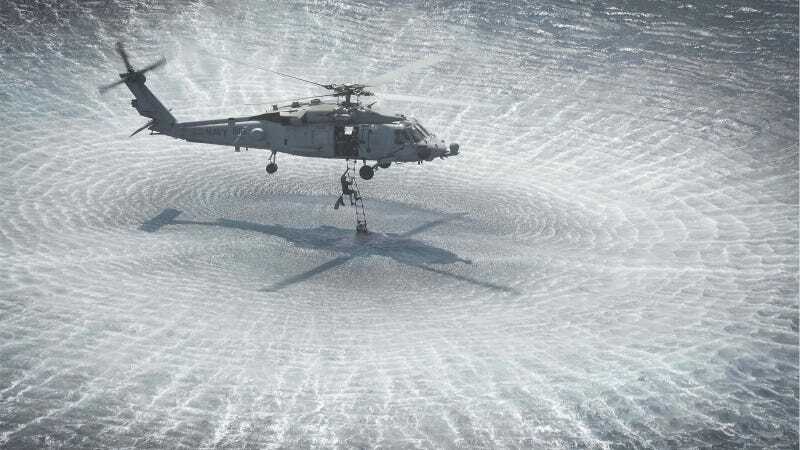 This photo of a HH-60H Sea Hawk Navy helicopter, taken on April 12th, is virtually flawless. The whole scene is like a well executed model diorama: the sea surface like broken sheet glass; the Sea Hawk hovering, still on its rope ladder stand; and those two tiny navy technicians clinging on for dear life. A member from Explosive Ordnance Disposal Platoon 621 is hoisted by an HH-60H Sea Hawk helicopter assigned to the Dragonsalyers of Helicopter Antisubmarine Squadron (HS) 11 during a mine disposal exercise. HS-11 is embarked with Carrier Air Wing One (CVW 1) as part of the Theodore Roosevelt Carrier Strike Group. USS Theodore Roosevelt is deployed in the U.S. 5th Fleet area of responsibility supporting Operation Inherent Resolve, strike operations in Iraq and Syria as directed, maritime security operations and theater security cooperation efforts in the region.